For many years now we’ve put our logo on our wooden games using a rubber stamp and indelible ink (StazOn brand). This is a quick, clean, and inexpensive process. There’s just one drawback: if the game is left outside the logo disappears after about 30 hours of sunlight – not good. Our resident engineer, Chris Dixon, has come up with a much better solution: a heated stamping machine to permanently burn our logo onto the wooden games. Surprisingly, there was no off the shelf tool available at a sensible price to do this, so Chris has used his creativity to build one from parts. Our starting point was a Chinese handheld hot foil stamping machine that we bought off ebay for £80. It’s worth noting that we’re not using any foil in this process, we’re using it as a hot stamp rather than a hot foil stamp. We made sure it had a thermostatically controlled temperature dial, as we know it’s important for consistent branding to maintain a stable temperature of around 360 degrees Celsius. We then purchased a custom brass stamp with our logo on it from M Shaw Engraving, and a Clarke drill stand to hold the stamping machine. We visited our local blacksmiths to make up some metal parts to enable the branding iron to be securely held in the drill stand. For a good quality result, it’s important that the brass stamp make contact evenly and with consistent pressure against the wooden surface. We achieved this by fitting springs and smooth shanked bolts in the stamping machine. 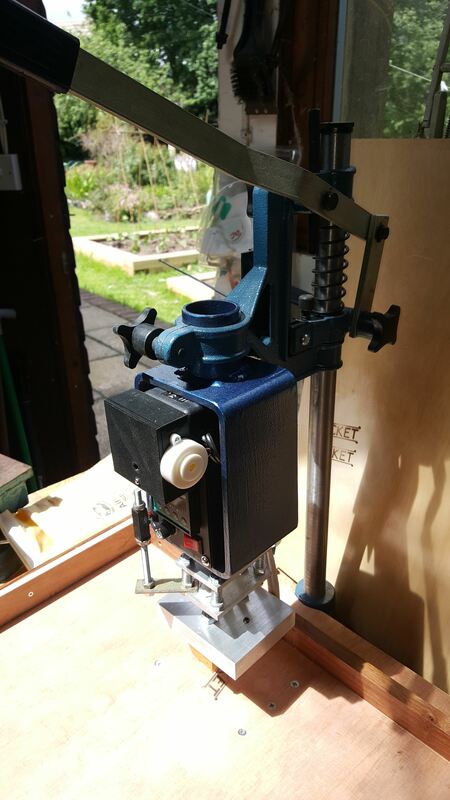 By adjusting the level of compression on the springs, as well as the maximum travel on the drill press, we could now set up the system to always exert the same pressure on the wood. We found that about 2kg of pressure was perfect. The final variable to be fixed was time: 3 seconds was about right. To eliminate guesswork, Chris soldered together a timer and buzzer from Maplin. 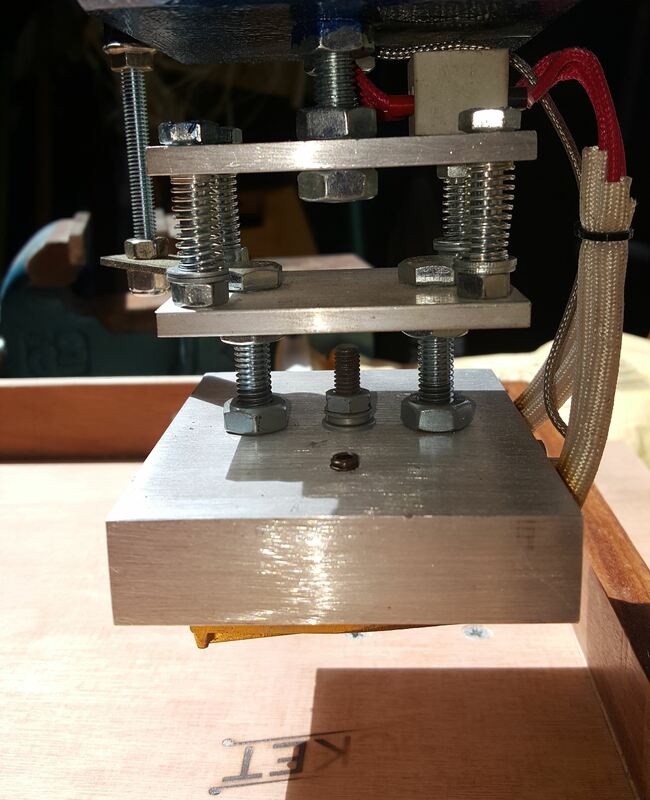 We made use of Monkeypuzzle’s excellent 3d printing filament to create a box for the PCB, as well us a sloped component to activate a micro-switch to start the timer automatically when the branding iron was lowered. The heated stamp has now been sent to our manufacturers in India, and we’re looking forward to seeing the first batch of games that will benefit!